QI Talk Forum | View topic - The shame, the shame! Here I was, watching the latest ep of QI when something caught my eye in the title sequence. Since i had the ep saved on my comp i went back to the first few frames, and what do i see? A filthy typo. Not a normal typo, but a typo of an American spelling of the word Sulphur. Is it just me, or does this annoy anyone else? Now -that- is eagle-eyed viewing. I bow down in slightly awed admiration. • noun 1 a combustible non-metallic chemical element which typically occurs as yellow crystals. 2 the material of which hellfire and lightning were formerly believed to consist. — ORIGIN Latin sulfur, sulphur. Maybe this will help put your mind at ease. As far as I can see they've mis-spelt it entirely. The American spelling of 'sulphur' is 'sulfur', not 'sulfer'. Somehow though I don't think that it will make it onto the next edition of 'Aunties Bloomers' alongside Blue Peter presenters being bitten by poisonous spiders and the cast of East Enders walking into doors. Oh now I see what you mean. I thought you were talking about the larger 'sulfur-containing' partly obscured by the magnifying glass. My monitor is set to fairly low brightness and contrast levels because I hate these blindingly bright screens. Only after djgordy actually wrote the offending word I realised it was about something else. I had to crank up my monitor in order to see the highlighted section with the smaller letters. Sulfer still generates 235,000 hits in Google so its use is fairly widespread. I think there is more going on than just a typo. Something for the linguists here? Sulfer is the old Dutch spelling for sulphur/sulfur (now 'zwavel'). With the considerable influence of the Dutch language on especially American English sulfer could have been a widespread spelling in America in the past before the spelling sulfur became 'official'. Maybe what we are seeing in the background is an old American scientific text. Perhaps the QI elves can find the source of the text. At least they got 'scleroproteins' right. Didn't your mother ever tell you not to sit right up next to the television? You'll get square eyes. Thanks guys, I had no idea sulfer was Dutch. I think that must be why it's in such common usage. It's a bit of a shame that Jump copy-pasted (they're usually quite observant) but you can't really blame them when it's such complex stuff. Speaking of such things, I wonder if anyone might know why 'than' and 'then' seem to be interchangeable to a lot of people. Just the fault of the education system? Oh, and dont worry natalie. I have a widescreen monitor so my eyes are still their normal rectangular shape..
Not sure about an ancient american text, but the text pasted above has a strange resemblence to this article on Keratin, from answers.com (who generally get their information from wikipedia). The helical keratin molecules twist around each other to form elongated strands called intermediate filaments. The formation of a covalent chemical bond called a disulfide bridge between the sulfer atoms on two cysteins on separate polypeptide chains of keratin allows for the cross-linkage of these chains and results in a fairly rigid aggregate. I hadn't tried to read more of the text before. Now I have I think the words suggest a level of knowledge of a more recent nature. A relevant Google search on the phrase "are ordinarily insoluble in water" from the image provides many similar sources. When combined with 'sulfer' only one remains. That Lycos Factmonster article contains both spellings 'sulfur' and 'sulfer' as does the 'answer.com' article and quotes The Columbia Electronic Encyclopedia, 6th ed. Copyright © 2004, Columbia University Press as its source. Which one would reasonably assume to be closely related to this site. But when you enter 'keratin' there it does not know the subject!!! When you perform a simple Google search on 'keratin' and 'sulfer' the top result points to encyclopedia.com which article again quotes the sixth edition 2006 as its source. 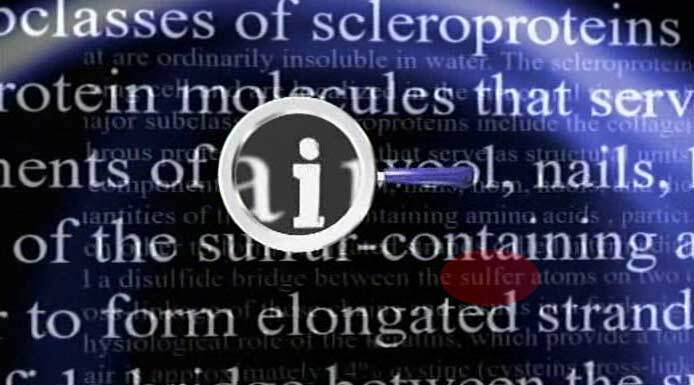 scleroprotein, large class of protein molecules that are ordinarily insoluble in water. The scleroproteins are employed principally for architectural purposes in the living cell and are localized in the structural tissues of bone, hair, skin, wool, silk, nails, hooves, and feathers. The major subclasses of scleroproteins include the collagens, elastins, and keratins. (kĕr´etĬn) , any one of a class of fibrous protein molecules that serve as structural units for various living tissues. The keratins are the major protein components of hair, wool, nails, horn, hoofs, and the quills of feathers. These proteins generally contain large quantities of the sulfur-containing amino acids , particulary cysteine . The helical keratin molecules twist around each other to form elongated strands called intermediate filaments. The formation of a covalent chemical bond called a disulfide bridge between the sulfer atoms on two cysteins on separate polypeptide chains of keratin allows for the cross-linkage of these chains and results in a fairly rigid aggregate. This phenomenon is seen to be consistent with the physiological role of the keratins, which provide a tough, fibrous matrix for the tissues in which they are found. Human hair is approximately 14% cystine (cysteins cross-linked by disulfide bridges). Columbia Encyclopedia, Sixth Edition, Copyright (c) 2005. You can see the first occurrence of the word in the QI-image but unfortunately it is obscured by the magnifying glass so its spelling cannot be seen. I think the origin of the text is clear though. And the keratin text has another typo too! Did you see it? Disulphide bonds are formed by the oxidation of two cysteine residues to form a covalent sulphur-sulphur bond which can be intra- or inter- molecular bridges. No, wait- Particularly. They missed out an L.
Jebus, I feel so very uncool right now. Though I think it's probably more likely that they just hired some design agency or suchlike to produce something that looked good, said agency obviously being not quite as rigorous in their research as we know the elves always are.